A Russian-built imaging satellite launched Wednesday aboard a Soyuz rocket to supply Egyptian authorities with high-resolution views of Earth for environmental, scientific and military applications. EgyptSat 2 is owned by Egypt's National Authority for Remote Sensing and Space Sciences, a government agency tasked with gathering and studying satellite imagery of the Earth. 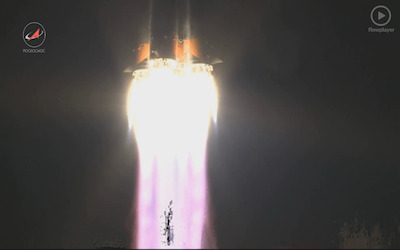 Fitted with an Earth-viewing telescope and camera capable to spotting surface features as small as one meter, or 3.3 feet, the satellite lifted off at 1620 GMT (12:20 p.m. EDT) on top of a Soyuz rocket from the Baikonur Cosmodrome in Kazakhstan. The three-stage launcher flew northeast from the sprawling space base before deploying the EgyptSat 2 spacecraft into orbit about eight minutes after liftoff. According to Roscosmos, the Russian federal space agency, EgyptSat 2 is equipped with modern imaging technology to return high-resolution images in visible and infrared wavelengths. Egypt will use the data for agricultural, geological and environmental studies, Roscosmos said. The satellite weighed about 1,050 kilograms, or 2,315 pounds, at liftoff and is designed for an 11-year lifetime in orbit. EgyptSat 2 was manufactured by RSC Energia, a Moscow-based space contractor. The satellite's optical camera system can capture single-scene or stereo imagery in a swath as wide as 1,400 kilometers, or 870 miles. EgyptSat 2 carries three solar panels deployed in a triangular shape to generate power for the spacecraft. The Energia-built satellite platform may also use an efficient xenon-fueled electric propulsion system, according to news reports. The mission is Egypt's second remote sensing satellite, following a smaller Ukrainian-built spacecraft launched in 2007. The precursor EgyptSat 1 satellite failed in 2011.